It is quite hard to explain in entirety about my love for the movie “Sleeping Beauty”. It is easy to talk about a subject with minimal points about something I appreciate, because there is so little to talk about, but when it comes to this film.. I am absolutely tongue tied because there is so much to talk about. As a child I was fascinated with this film primarily for the antagonist Maleficent, who single handedly taught me the art of sarcasm. While on one hand I was terrified by her ruthless antics against Princess Aurora, I was also simultaneously captivated by her cool demeanor. For years I strived to find a compelling villain that rivaled the characterization of Maleficent, and still at 35, cannot find a character that comes close. As an adult I fell further in love with this film for the art stylings of Eyvind Earle, whose geometric bliss of backgrounds saturated my youthful artistic mind with such possibility. His stylings were so ahead of its time, and his vision in this film makes this not just an incredible animated piece, but a progressive ‘out of this world’ foundation of artistic genius. 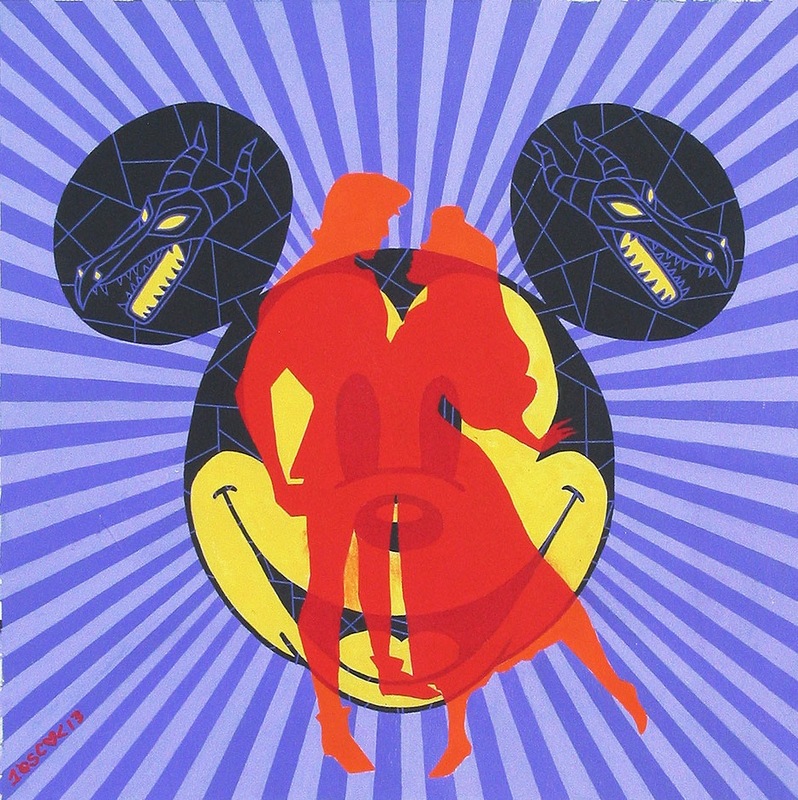 In this piece, entitled “Double Dragon”, Maleficent is shown in creature form mirrored on both sides of the canvas to represent a sense of ‘no escape’ and ‘clutches of evil’ aspect to the protagonists in the middle. However in the epicenter of the painting, Aurora and Prince Phillip are in a silhouetted embrace of love, creating an explosion that radiates out to the edges of the canvas. Furthermore, the power of love ultimately splits the foundation of Maleficent’s power, creating deepening cracks to signify her destruction. This is the 2nd in the Disney History Series, and 59th in the TENxTENxTEN collection.